Co-author Lenny Cavallaro will appear at the Buttonwoods Museum in Haverhill on Wednesday evening, January 19th, 5:30-6:30. He will join other writers making brief presentations of their work. Cavallaro will also participate in the local authors' event at the Zorvino Vineyards in Sandown, New Hampshire, Friday night, February 11th, 6-9 P.M. The authors were delighted to hear from Dr. Ben Crystall, who thus became our first overseas contact. Ben was a member of the team of British divers who worked on the Plymouth wreck during the 1980s and eventually brought up a section of the deck. We hope he enjoys the book! Co-author Lenny Cavallaro spoke about the Arnold, the controversy, and even the belated recognition for those on board (cf., Congressional Record) on Monday, April 26th. The presentation was well received, and the audience asked many questions. Cavallaro hopes to discuss the topic elsewhere on the North Shore. Bob Jannoni, Lenny Cavallaro at MA Treasure Hunting Assoc. Bob Jannoni held the floor at the January 15th meeting of the Massachusetts Treasure Hunting Association in Newton. Joined by co-author Lenny Cavallaro, he discussed the tragic events of 1778, the evolution of our book, his ongoing research to find the names of the dead, and the great satisfaction of seeing the brave colonists who made the ultimate sacrifice finally acknowledged in the Congressional Record. 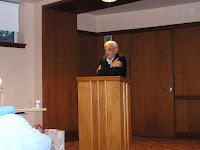 Co-author Bob Jannoni addressed the audience and fielded questions at an author's event hosted by the Thomas Crane Public Library in Quincy, Massachusetts, Wednesday, September 16th. We hope that other libraries and historical organizations will contact us about presentations at similar events: Two_Capes_Press@yahoo.com. I am a composer of classical music and concert pianist. My website has more information. I am also involved with literary pursuits. JanusLiteraryAgency.com has more information. I have a very small therapeutic practice as well. FourLevelHealing.com has more information. Other parts of my life include chess, futsal (a form of indoor soccer), and karate.